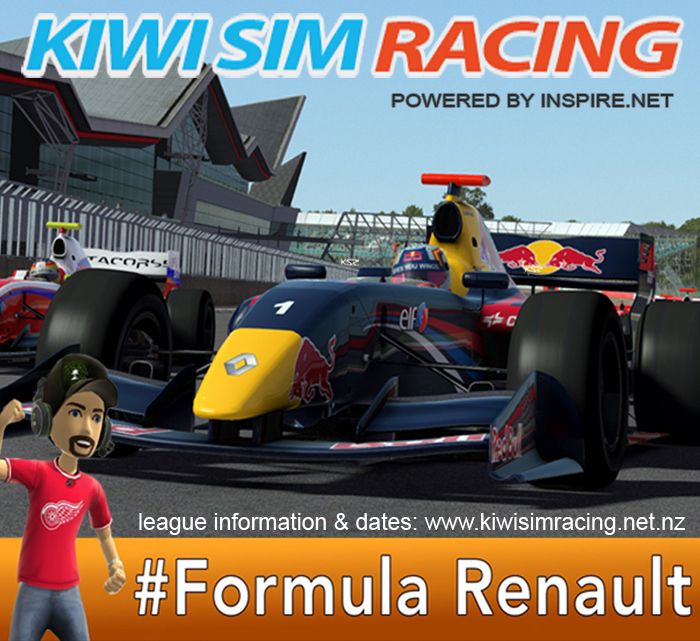 This season we take racing to new waters on rFactor 2 here at Kiwi Sim Racing - Our first open wheel series! We take the very polished and well made Formula Renault around some of the Grand Prix circuits around the globe in what promises to be some excitable racing. Each round of this series will consist of two races - one sprint race, and one feature race. Feature - Approximately 45 minutes long, every car must make one Compulsory Pit Stop for 4x Tyres, within the pit window (Pit Window will be posted in each weeks race thread). The grid will be set from the results of Race 1, with the top 8 drivers reversed. We will be enforcing an upgrade option to be mandatory - "Aero Package High". This is the default setting, and we have decided to enforce it as mandatory as there is a lot of variance between the Aero packages. We feel the high package will promote the best racing and promote the closest results and less racing incidents. The different aero packages do have a distinct visual difference so anyone caught using a different Aero Package will be penalised accordingly. These cars come fitted with a DRS system. As this system requires every track to have DRS zones correctly implemented, and the lack of quality tracks that do have DRS zones, we have decided to BAN the use of DRS throughout this series. The tracks we have chosen make the DRS unusable during the race, however during practise and possibly qualifying the DRS system may still work. We are making an absolute zero tolerance ruling on the use of DRS - and yes, the DRS does have a graphical alteration on the rear wing, as well as a light on the steering wheel, so it will be easily picked up on if you do use it. Please refrain from post-race chat and celebrations ("congratulations", burnouts etc.) until after all competitors have crossed the line. Then make sure you sign up at the Points Site, once the league has been opened there (a post will be made in this thread when it is available). If you need any help signing up, you can post here. Teams of two may be entered on the points site. Races will feature a 50% race completion threshold in order to qualify for the finishing bonus. Races will also feature a crossing the line bonus if you complete the race. There are a couple of pieces of information to consider. 1) These cars do not allow refueling in the pit stops. 2) Pit-Stops do not fix major mechanical damage. Ah shoot, unfortunately I won't be able to join tonight as I'm away for work. Could someone be so kind to share their setup(s)? I've been able to get down to low 1:37's (without DRS) - if I add all my best sectors together, a 1:36 should be possible but I'm struggling to get it down any further. Any tips on that first chicane would also be appreciated as that one keeps doing my head in! Well to be quite honest with you Erik, before the server got reset you had the fastest time! So uhh, any tips? For instance, how did you get up to 292 km/hr (without DRS) - I cannot get the car to go faster than 278 on either the main straight or at max 272 before hitting Ascari? Vehicle upgrade allows you to set a 'low/med/high' downforce preset. This is likely where the speed came from. As riven said, we found last night different aero packages in the upgrades. We have decided to lock the upgrades to just the high aero package to promote closer racing. So I take it that I had been running the high aero package judging by the lack of top speed? Can’t wait for the new league to start though getting back in the GT3 next week will take getting used to again! Did we swap out the previous version of the Monza track for a different one? This version seems a little more forgiving than the other one in the chicanes but no tarmac runoff areas? It feels a bit different to drive. The dip in Lesmo 2 also isn’t destabilising the car as much anymore. Riven would beg to differ about the dip! The main reason for the change was this version didn't have DRS zones so was easier to police our No DRS rule. I agree with Riven about the dip. On exit it tries to snap out. So it seems I still have an issue with rF2. The first time I connect to the server I lose connection instantly and the entire game closes back to desktop. No error or pop-ups. I can then rejoin and drive for a couple of minutes but then it does the same, closing to desktop. The weird thing is, when I go back into rF2 again, all my wheel button key binds are back to default. I've now uninstalled rF2 and reinstalling today, so hopefully it behaves tonight! I found some time a week or so ago and thought I'd give it a go. Sadly RF2 has decided it doesn't really want to talk to my wheel anymore. Amazing how RF2 has so many problems. I wasted the afternoon, and drove zero miles. Thought I'd take another crack at it tonight, but to no avail. Fortunately every other racing game I have works fine. Wreckfest FTW! I've just uninstalled it, to see if that helps. Sigh. Life is too short. What wheel are you running? :help: So it seems I still have an issue with rF2. The first time I connect to the server I lose connection instantly and the entire game closes back to desktop. No error or pop-ups. I can then rejoin and drive for a couple of minutes but then it does the same, closing to desktop. So after reinstalling rF2, it is still crashing to desktop. Oddly, it seems to be even worse in single player, as I barely pull out of the pit bay and the game disappears. Could it be a corrupt profile or something? I'm getting ready to completely delete EVERYTHING and start from scratch. Anything come through via Event Viewer? On a side note, can we get the server to roll over to Silverstone for practice? Thanks for running this series and for hosting! These were my first open wheelers and I really enjoyed racing them!! I definitely would be up for another round of these on different tracks in the future again! And I can't wait for the final results to be loaded onto the league points site to see the final standings in the series!